'Baralla Galega' was designed by X. Cobas and published by Imprenta Comercial Imprent S.A., La Coruña (Spain) in 1983. 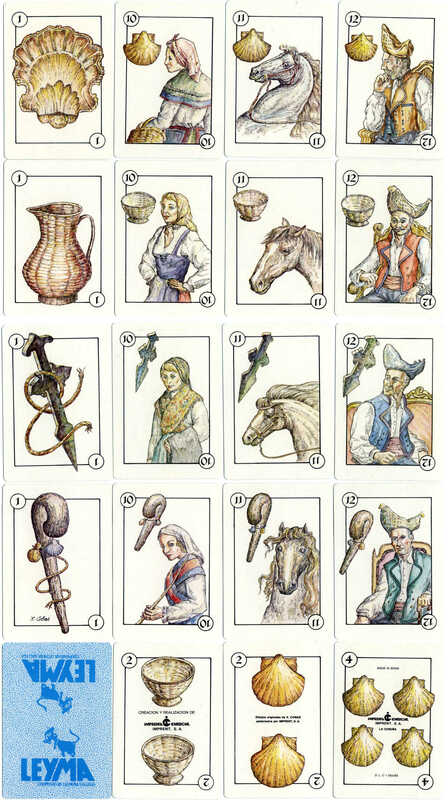 The design of the cards is based on the folk traditions, symbolic objects and regional dress of Galician people in northwest Spain. Galicia is an autonomous region in Spain and has its own official language. A revival of Galician language and culture has been taking place and tourism improves the region's economic outlook. 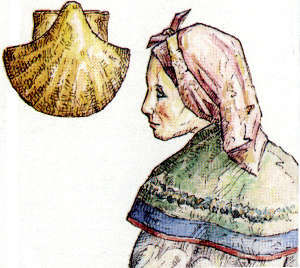 The scallop shell, or concha de vieira in the Galician language, became associated with the pilgrimage to Santiago. Above: 'Baralla Galega' was designed by X. Cobas, whose signature appears on the Ace of Clubs, and published by Imprenta Comercial Imprent S.A., La Coruña (Spain) in 1983. The reverse has an advertisement for a dairy cooperative. 40 cards in box.